Our People & Culture, Community, the Environment & the World at Large. 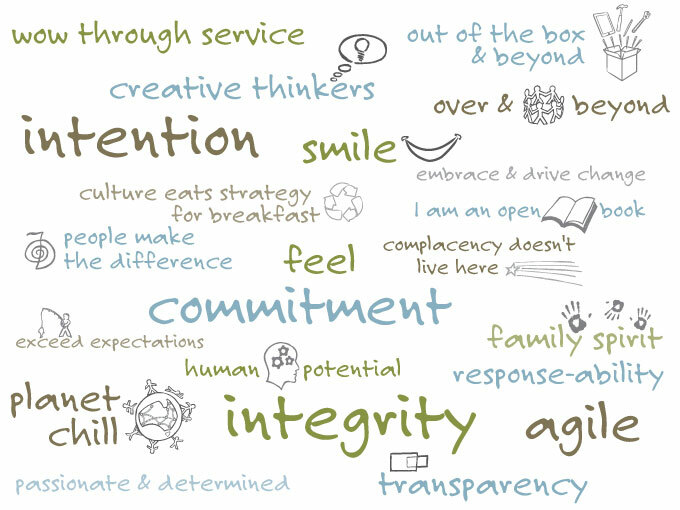 As defined by ‘our’ people in Chill – these are our 22 guiding principles. Our values reflect all that’s best about Chill. We express a code of behaviour that guides everything we do & together they embody the spirit of Chill. We believe that we have a responsibility in creating a promising future —not only for our company but also for the community & environment. For us, company culture is a top priority. Chill’s culture embodies many elements. It’s about always looking for new ways to ‘wow’ the people that come in contact with us. It’s about building relationships, where we treat everyone with honesty, mutual respect & like family – lets face it, we spend more of our waking hours in a day with the people in our workplace. It’s about team work & having fun & not taking ourselves too seriously. It’s about growth, both personal & professional. It’s about achieving the impossible with fewer people. It’s about taking risks, embracing change & not being afraid to make mistakes. Complacency doesn’t live here. But more importantly, its about faith – that if we do something right, then in the long run we will succeed together & build something great we can all be proud of. At Chill, we want an open & creative culture that harnesses diversity & inclusion to inspire ideas & ignite innovation. We want our people to know that we are a company that stands for creativity & inspiration in an industry (transport & logistics) that has an image of having low barriers to entry & poor industry image. Nourishing innovation is both art and science. It demands creativity, patience and a high tolerance for failure. It also demands dedication & rigor. Our working definition of innovation is a new solution. A new solution to an old way of thinking & doing things. And it’s not just in product development or a new services where we look for innovative solutions. Our entire sustainability awareness & goals within Chill is built around innovation due to identifying, implementing & actioning ways to reduce energy consumption & the overall operation of the business. Innovation goes hand-in-hand with sustainable development initiatives, as both require progressive leadership and an appetite for change, combined with a tolerance of experimentation and some risk. We are actively involved in many local charities such as Lifeline Community Fundraising, Backyard Buddies Animal Sponsorship & Surf Life Saving Support. In addition to donating rental equipment to charity fundraising events such as Cure Cancer research we also support the Greyman in their efforts against human trafficking, our team members are involved by organising fundraising events that bring like-minded people together for music & cultural events & raise much needed funds for the Greyman. So, whether we are championing an event to support children in poverty stricken areas or campaigning to fight against slavery in South East Asia through the Greyman Charity. We want our people to know that we stand for something & we believe in them to create change & empower them to play a part to progress forward with success. We produce & share employee handbooks that cover company missions and maxims, as well as specific guidelines on conduct, including ethical behaviour, conflicts of interest, corruption, corporate responsibility, anti-harassment & anti-corruption, & a violence-free workplace. Our team is our most important & immediate social responsibility; to provide secure & stable employment. To create a business environment that is healthy & attractive, one that will benefit the well being of those that work in or visit it. We have always (since inception 2000) had a strong environmental focus around recycling, reusing & waste reduction. And when we think back, sustainability has always been the vital ingredient to our growth. We just didn’t know it had a term or word that summed up what we were always doing, until more recently. Sustainability is a term widely used today, contributing to everything from lifestyle choices & purchase decisions to corporate social responsibility (CSR) strategies. Our vision of the future is one which we see a world in transition from an industrial economy to a sustainable economy. Our achievements will build leadership, a competitive advantage and performance with an audacious goal to be carbon neutral by 2017, our conservation actions will ultimately support healthy, sustainable economies; promote human welfare; and protect the natural resources we need to thrive. Our belief is business has a responsibility to protect the environment in which it operates. Chill is committed to reducing our environmental footprint, embracing sustainable & environmentally sound business practices, to improve performance & profitability. Let’s face it; sustainability is also about bottom line. And we believe this is a critical moment – one when environmental necessity & business opportunity have finally converged, so that the world can profit from change. While many still see a contradiction between economic growth & environmental protection, it turns out that sustainability oriented business policies contribute to long-term value creation. Not only does growing customer demand translate into more sales, sustainability has & will continue to become a key success factor in shaping the reputation of Chill.